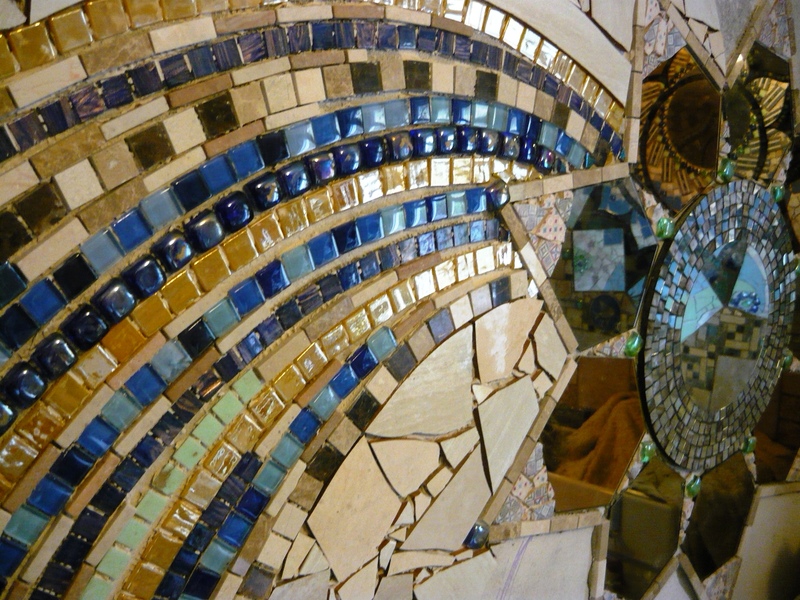 We are very happy and proud to announce that our big mosaic floor in the extension now is finished. The actual tiling part of the job was completed a couple of months ago but we only put down a first layer of grout to bind it all together at that stage. We have been busy building, insulating and painting the different wall sections since then but this week all of that work was finished and we could move onto the final stage of the floor. 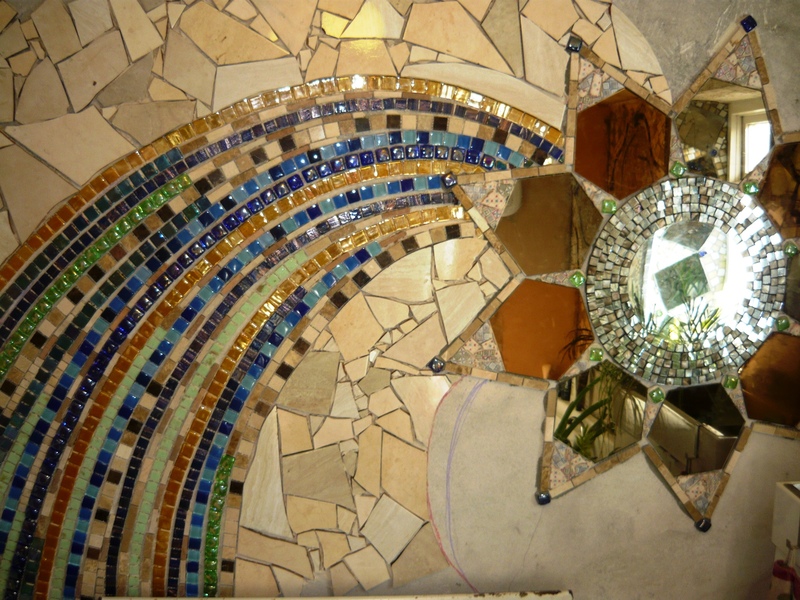 Wish upon a star mosaic. 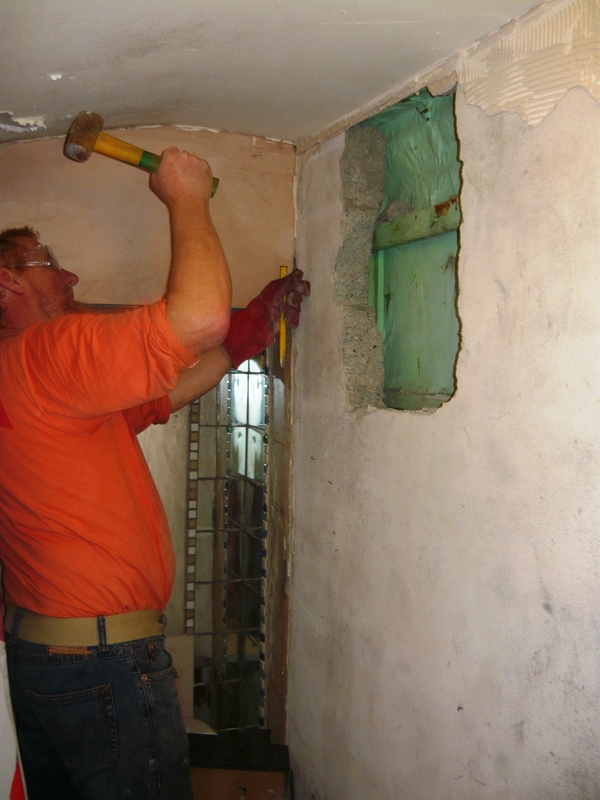 We have been hard at work for the last two days, tiling another wall in the bathroom. 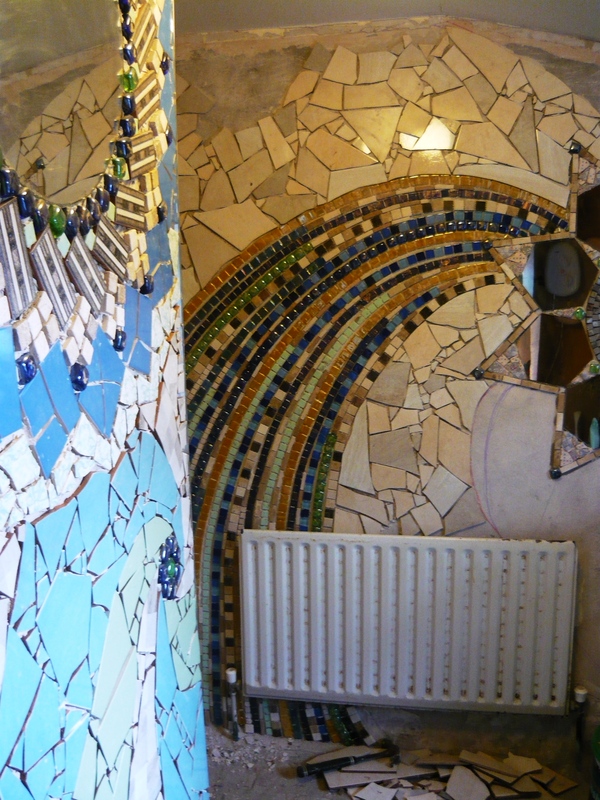 We had a lot of small mosaic tiles, about half of them found in a tile shop skip, and we wanted to incorporate some of them into the design on this wall. 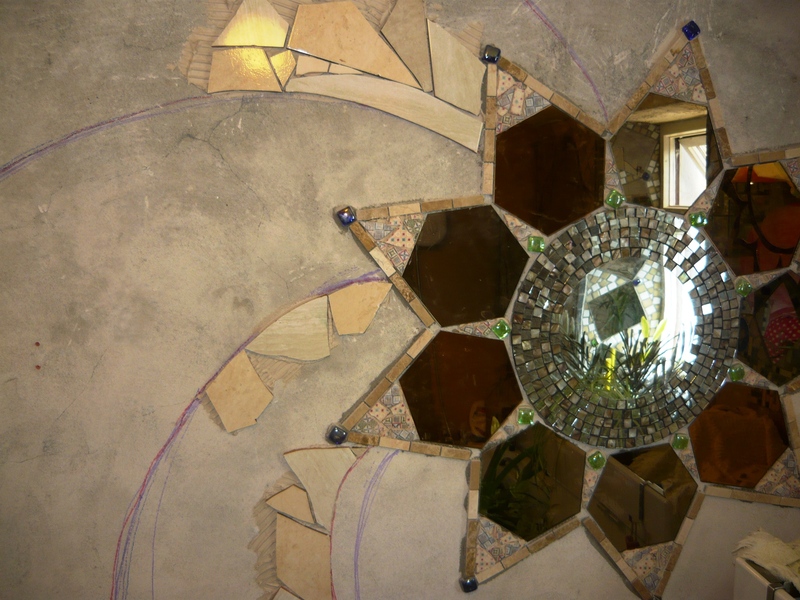 We also had some hexagon mirrors bought at IKEA and a round mirror with a shell mosaic around the edge. We played around with these components until we decided on a shooting star design. The trail of the star was perfect for adding the small tiles to in curved lines, alternating colours and structures. We added a sections of mixed light coloured tiles each side, as a contrast to the busier colours and tomorrow we will do a slightly darker area of tiles all around the star. We are hoping this will make the star stand out in a pretty way. The entire wall will be grouted in a medium grey grout and it should bring all the areas together and create a beautiful whole. 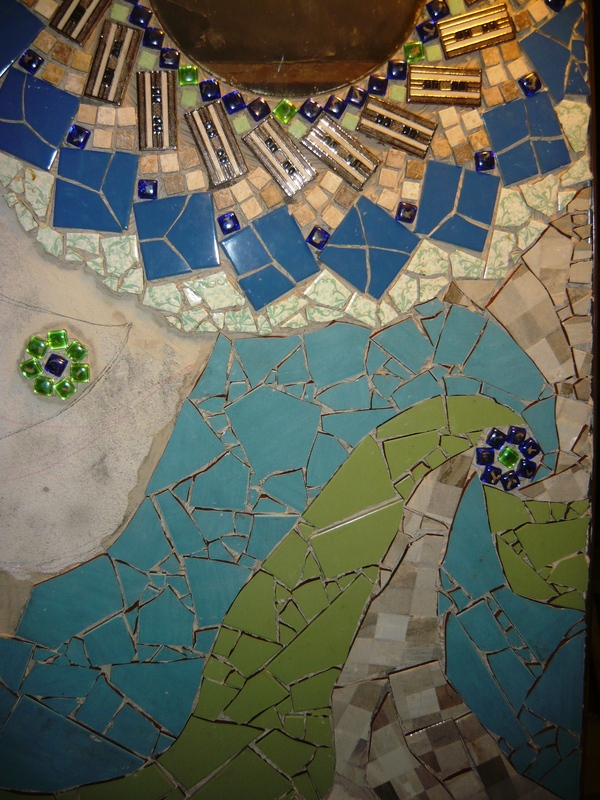 If you wish to see more of our mosaics just go to the mosaic category on the right hand side. A shooting star is very practical to have around as every time life gets a bit difficult or sad you can make a wish. As part of our extensive bathroom renovations, we have now reached the tiling stage. Two days ago we started knocking all the old tiles and plaster of the walls, and yesterday it was time to get tiling. 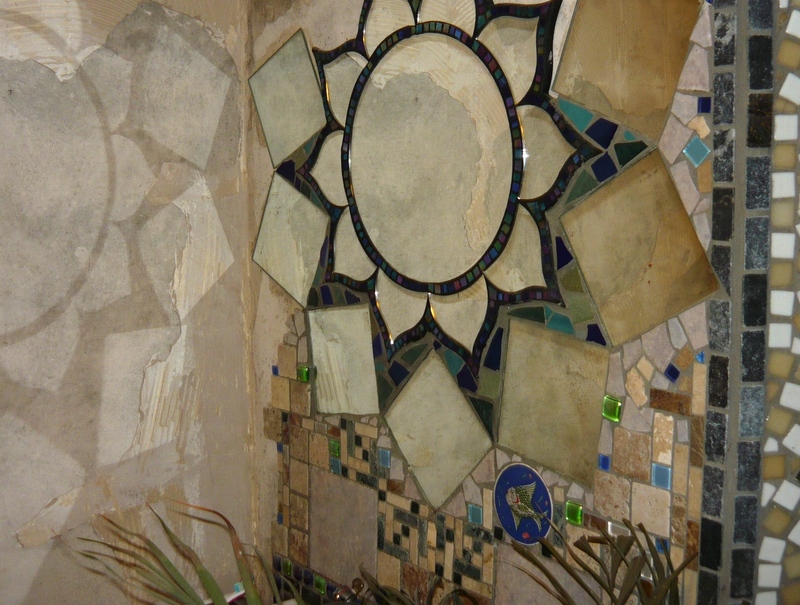 If you have read any of our other posts in the Mosaic category, you will know that we always keep an eye out for old, thrown away and salvaged tiles and mirrors. Most of the tiles for our bathroom come from free sources and saves us money as well as being good for the environment. 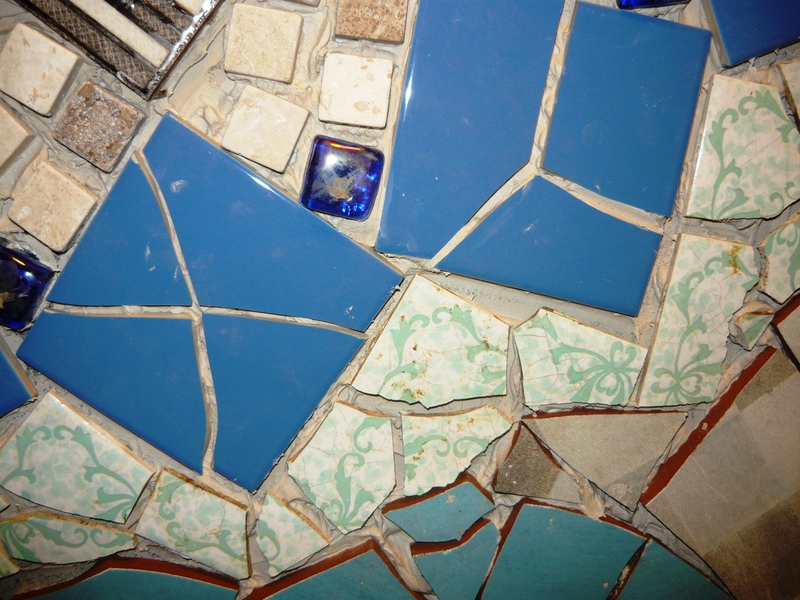 For this project that has a lot of small pieces, it is easiest to use the ready mixed tile adhesive in a tub. It stays flexible for a long time and makes for easy positioning and a smooth surface. When digging in the garden we have found a lot of turquoise patterned old tile pieces. Our guess is that they were once in the house, perhaps in the very same room we are now tiling, as it used to be a small kitchen and not a bathroom originally. It feels good to put them up on the wall again, in a slightly different way. 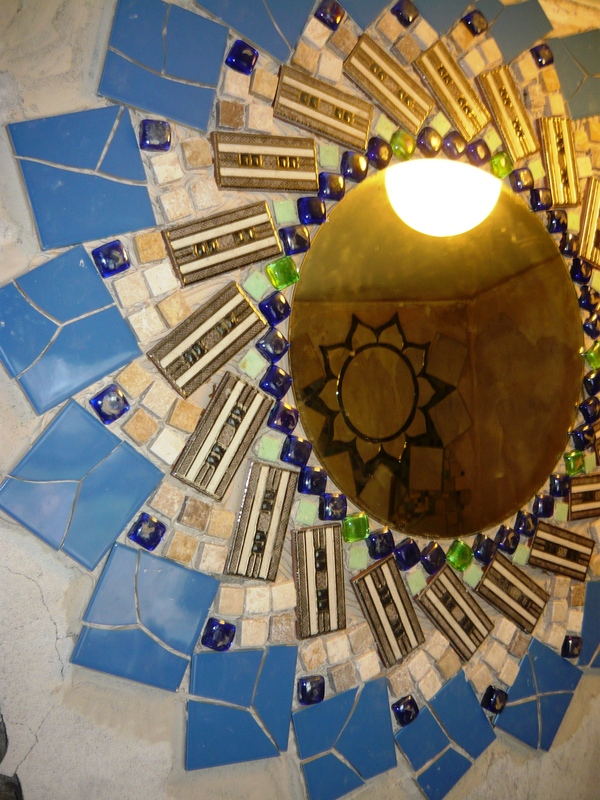 It is important to have a design idea and here we started with the round mirror, building outwards with different tiles, like a mandala. Most of these components came out of a tile skip behind a shop. For the bottom part of the wall we went for a swirl pattern. 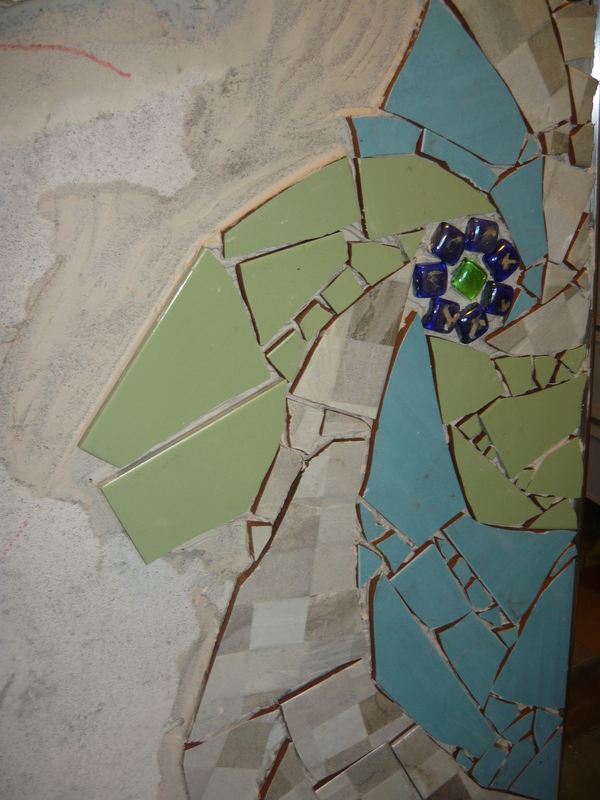 At first we tried just sticking the pieces on in a random design, but it looked quite ugly and had to be redone. 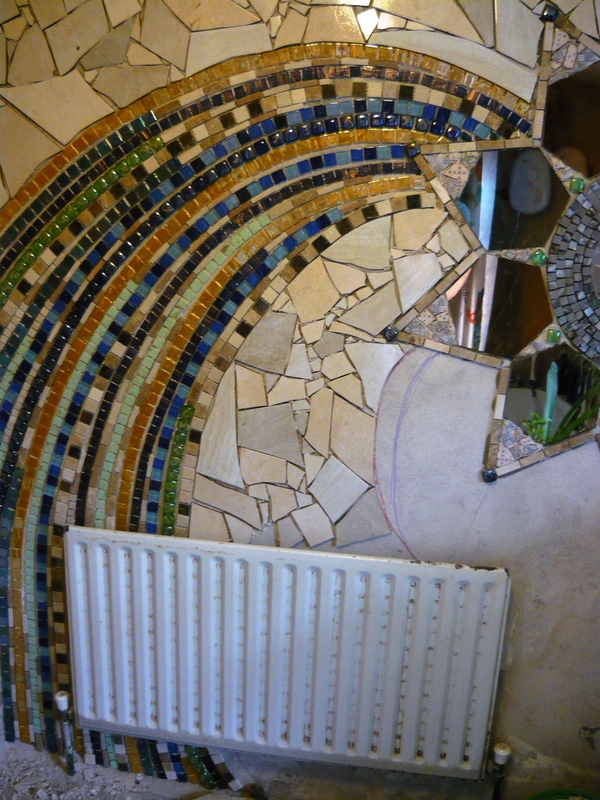 We are looking forward to finishing this mosaic up today and have it grouted in a couple of days. 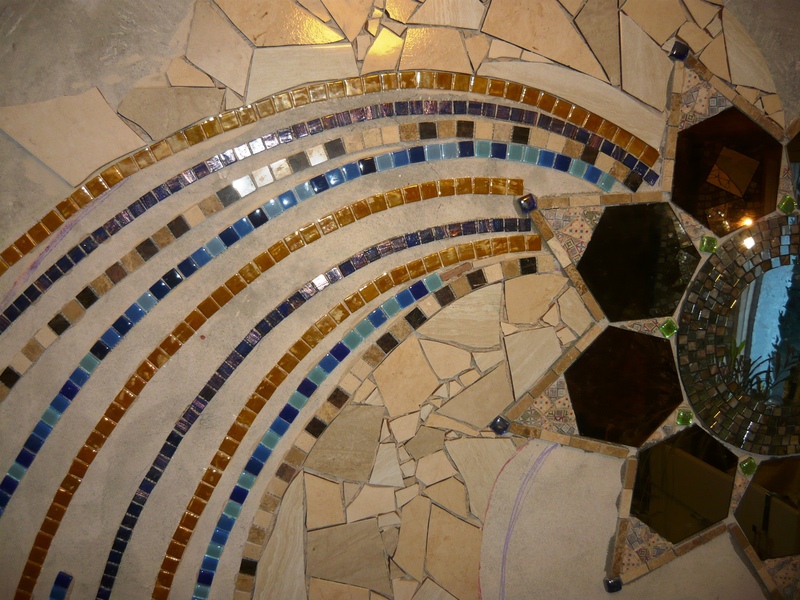 It makes a huge difference to any design once it is grouted, bringing all the elements together. 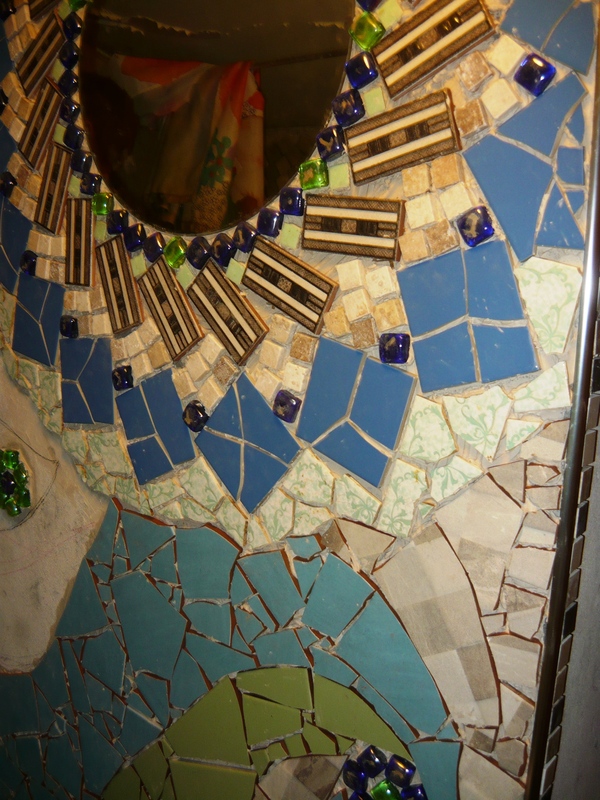 This is the mirror above the sink,that we tiled and grouted a while back. It casts a great shadow on the wall don’t you think? Our house was built in 1924 and the bathroom bit was added at a later date, we think sometimes in the 1950’s or 1960’s. When we took all the tiles of the wall and knocked away the plaster we found a lovely old sash window. This was the original outside wall and we will now use the window as a feature in the bathroom, adding some shelves to it for both beauty and practicality. We had to knock out the glass as it had been glued over with old Christmas wrapping paper and painted at some stage. 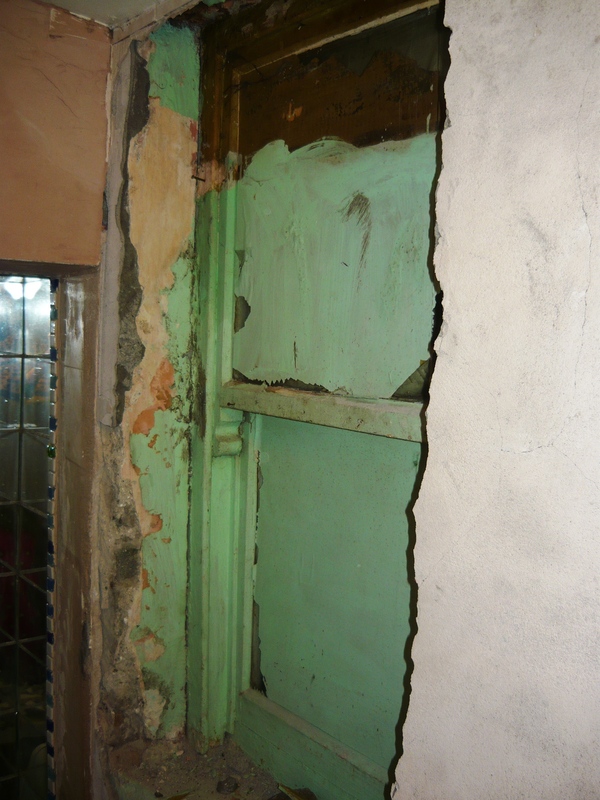 The window frame is in perfect dry condition, with no sign of woodworm, so we will build the shelves in a box behind it.